An exploration of what professional ethics is and what happens when it’s corrupt. The first issue we come to, is what is professional ethics, and how is it divorced from (or is it divorced from) morality. In the workplace managers and supervisors should set the standard for using ethics by showing respect, being honest, and promoting trust. If the management team uses unethical forms of communication, the team and business can fail … Promoting ethics in the workplace gives employees a sense of worth and trust that can help the business and employees succeed (Joseph, Joshua, 2000). 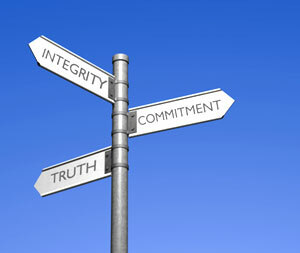 A professional’s ‘set’ of ethics carries with it additional responsibilities. These are moral responsibilities, provided in addition to what you could call ‘standard’ societal responsibilities: by virtue of specialised knowledge and access to specialised information. In the case of an organisation’s executive, the set of expanded morals that underlie professional ethics carry on outside the workplace. An employee is expected to uphold an organisations ethics whilst at work and, if a confidentiality agreement has been signed, to uphold that in accordance with its standing. A director, a CEO, or other executive, however, of standing in the community, is expected to uphold that organisation’s moral and ethical standing twenty-four hours a day, in any or all of his or her dealings. Any deviation from this can reflect negatively on the organisation, on the organisation’s staff, and on any reputation that that executive may have. Questions arise as to the ethical limits of the professional’s responsibility and how power and authority should be used in service to the client and society. Most professions have internally enforced codes of practice that members of the profession must follow, to prevent exploitation of the client and preserve the integrity of the profession … Disciplinary codes allow the profession to draw a standard of conduct and ensure that individual practitioners meet this standard, by disciplining them from the professional body if they do not practice accordingly. This allows those professionals who act with conscience to practice in the knowledge that they will not be undermined commercially by those who have less ethical qualms. It also maintains the public’s trust in the profession, meaning that the public will continue to seek their services. The key points here are that a professional has power and authority that should be used in service to the client and to society. And also that it ‘maintains the public’s trust in the profession, meaning that the public will continue to seek their services’. The problem with Codes of Ethics or Codes of Conduct is that they are often internally regulated. What this means is that it is difficult for people external to an organisation to monitor professional practice and professional conduct – which always leaves the possibility that a Code of Conduct could be set up improperly to look after the internal interests of an organisation. In some cases, professionals contravene an ethical point of view. This is often taken as professional abuse, and covers such elements as taking advantage of clients’ trust, of exploiting clients’ vulnerabilities, of not acting in their clients’ or organisation’s best interests, and worst of all, failing to keep within professional boundaries. Types of ethical responsibility vary according to type of company, type of organisation, or type of profession. In cases where an organisation is publicly funded (such as through grants in a not-for-profit sector), then a professional’s responsibilities do not involve responsibilities to shareholders and customers and are not limited to ensuring ethical profit-making. Instead, these professionals have a far broader set of responsibilities: including, but not limited to, ethical and moral conduct within the vision, goals and mission of an organisation, to governments, grant-providers, employees, and memberships, and their boards of governance should they exist. Computer Societies around the world such as the IEEE and national bodies in Australia, Singapore, the UK and other countries have on their websites professional codes of ethics to consider and adopt in the way professionals conduct themselves in and out of the work place. Things that are included are concepts like: professional respect, avoidance of dishonest or fraudulent activity such as plagiarism and the professional development of the individual. Another aspect of this is the enhancement of the profession and the industry within which the professional works. This concerns a professional’s conduct and behaviour while carrying out their professional work. This then, is work for the good of the community and mankind. The question is, what happens if a professional contravenes his or her ethical responsibilities, knowingly? Could that professional be seen as being corrupt? Well yes, if money is involved. But is there such a thing as ethical corruption? So, wrongdoing that contravenes ethical standards is, by the latter definition, ethical corruption. Avoiding such a situation calls for a strong level of transparency. Let’s say you have a lack of transparency – meaning, of course, a situation where a professional’s actions or decisions are not clear, are not communicated, are not candid. You wouldn’t make absolutely everything transparent, for example, when a managerial plan may be compromised by it. But once a plan is decided and put into action, that ought to be made available and clear to those who are affected by it. Transparency also boils down to an openness and selflessness that negates secrecy; one that avoids the hiding of personal benefits that may accumulate due to position or power, and that may benefit friends or family members. A professional in a not-for-profit organisation, therefore, could not engage in nepotism in any regard, because the organisation is not that person’s business. A sole-trader, however, could freely employ nepotism because that person is a business owner, with sole responsibility of trade and governance. It is a very predictable aspect of human nature to take advantage of the public trust and use it for one’s own personal advantage. If, however, a public servant is dishonest in his or her dealings with their organisation, their members or their public; makes fraudulent claims; is morally depraved (as defined by the moral standards and codes by that person’s society, profession, or organisation)… that person is then, technically, ethically corrupt. Limiting ethical corruption is difficult, but free participation is probably the easiest way to do so. This involves the hearing of suggestions, an appropriate complaints process that does not have a ceiling (and allows for complaints about all levels of an organisation, from administration to governance), and a process for those suggestions and complaints to be funnelled into an appropriate, effective improvement process. Promoting ethics in the workplace gives employees a sense of worth and trust that can help the business and employees succeed. If in any instance where ethics is shaky, what do you think happens to employees’ sense of worth and trust? That, too, starts to falter. In some cases, it can create immense levels of stress, and undermines an entire organisation’s effectiveness. An organisation or company is, after all, only as good as the people within it. Transparency, in issues where ethical corruption may be at the forefront, is vital. What it does is that it shows to any funding bodies, customers, members of the public, clients, memberships, staff, governing bodies (and so on), that the organisation itself is morally and ethically accountable, honest, and open. It ensures that free participation is possible, and it helps to grow trust and good standing: which in any business is absolutely essential. thankfully ethical standards are not set by one individual alone. bias and prejudice are more powerful than the ability to deploy a high-horsed tone, one’s ability to percieve it and pull it off varies, obviously. Yes of course. Thankfully common business sense and business law, as explained in this article, do much of it for us. Those of us who have run our own companies, with open, honest and clear communication between all parties, know it and practise it consciously. Some people, however, who allow other factors to cloud their judgement, can’t see where their ethics lies for the debris that lies over it.